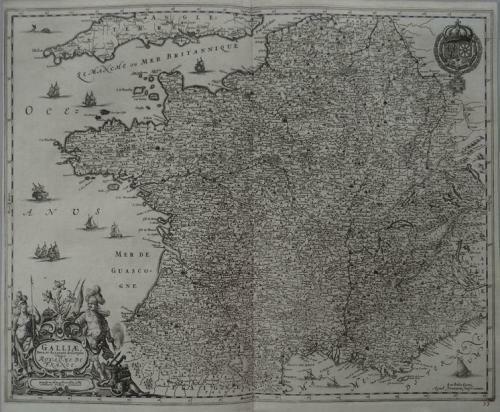 An elegant and very intricate map of France - seldom seen on the market. This is a reduced version of Frederick de Wit's map of France. The map extends to a portion of Italy and Switzerland and is filled with detail of the topography, cities and towns. It is graced with an elaborate cartouche flanked by a pair of warriors, with armor and weapons below, and topped with lilies representing France. The royal crest is shown at the upper right and ships and galleys sail the seas. Blank verso.